The Pittsburgh Ophthalmology Society’s 55th Annual Meeting was held March 29 at the Pittsburgh Marriott City Center Hotel. Over 85 physicians attended this year’s meeting, which featured renowned ophthalmologist Wallace L.M. 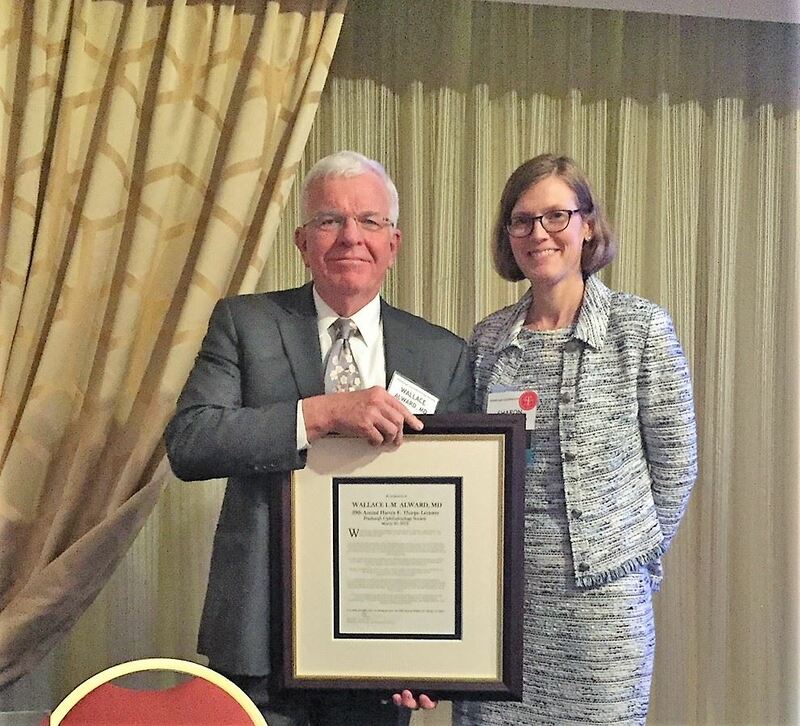 Alward, MD, who served as the 39th Annual Harvey E. Thorpe Lecturer. Attendees were educated with presentations from the following prominent guest faculty: Andrew G. Lee, MD, Neuro-Ophthalmologist and Chairman of the Department of Ophthalmology, Blanton Eye Institute, at Houston Methodist Hospital; Professor in the Departments of Ophthalmology, Neurology and Neurosurgery, Weill Cornell Medical College; Peter Veldman, MD, Assistant Professor of Ophthalmology and Visual Science; Director, Residency Program University of Chicago Medicine; and Sophie Bakri, MD, Professor of Ophthalmology, Mayo Clinic, Rochester, MN. In addition, the POS welcomed local guest faculty José- Alain Sahel, MD, Professor and Chairman, The Eye and Ear Endowed Chair, Department of Ophthalmology, Director, UPMC Eye Center, University of Pittsburgh School of Medicine. Following the meeting, members and their guests enjoyed networking and dinner at the Terrace Room in the Omni William Penn Hotel. In her final remarks as President, Sharon Taylor, MD thanked the POS Board, Membership and Allied Course Directors for their assistance during her tenure. 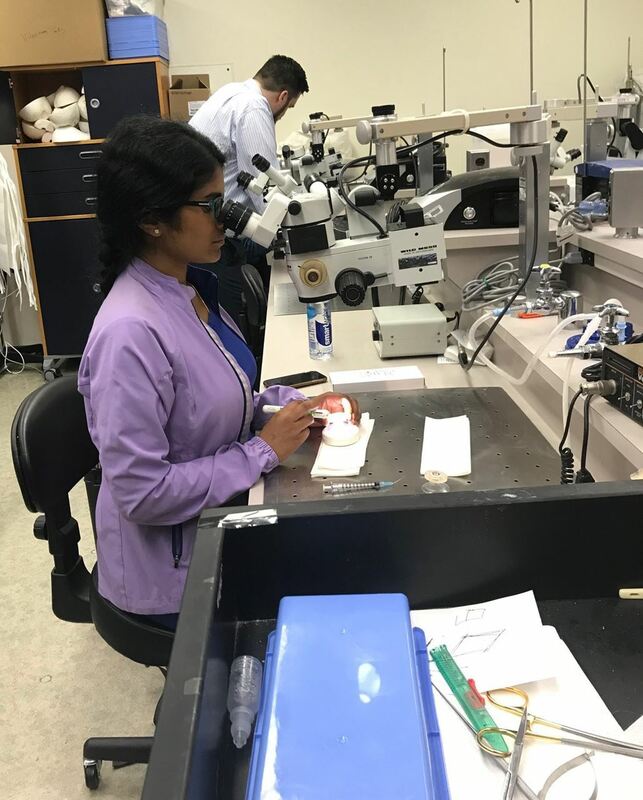 In her two years as president, she initiated the Wet Lab program (a hands-local program which is typically found at larger ophthalmology conferences. Board member Ian Conner, MD, PhD was also instrumental in the planning of the Wet Lab series. Dr. Taylor formally installed David G. Buerger, MD, FACS as President. His first officially duty was presenting the President’s plaque and thank you gifts to Dr. Taylor in recognition of her service. 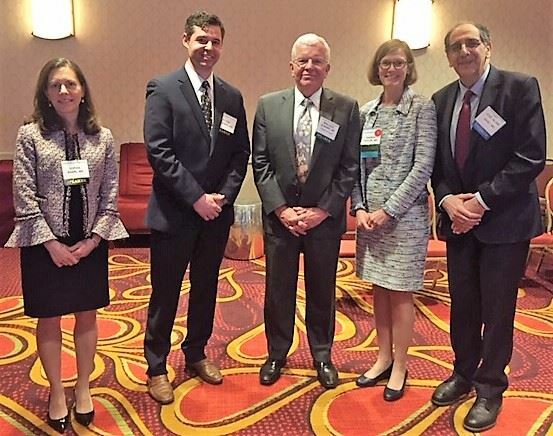 55th Annual Meeting Guest Faculty: (l to r) Sophie Bakri, MD; Peter Veldman, MD; Wallace Alward, MD (Thorpe Lecturer); Sharon Taylor, MD and José- Alain Sahel, MD. Running concurrently with the POS Annual Meeting was the 40th Annual Meeting for Ophthalmic Personnel. 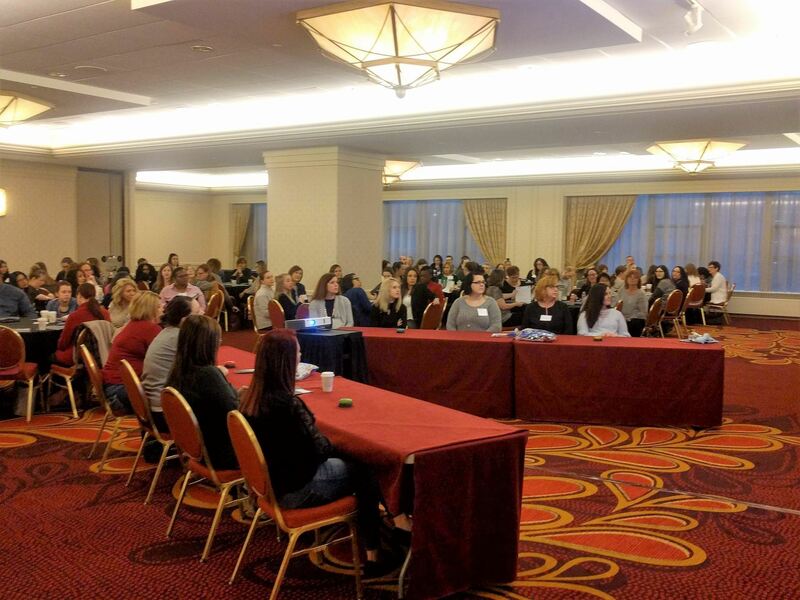 Course Directors Pamela Rath, MD and Laurie Roba, MD were pleased to announce that a record number (185) of ophthalmic technicians, assistants, coders, photographers and front staff attended this full-day program. The well-respected program is designed specifically for ophthalmic personnel to enhance the quality, expertise and safety of ophthalmic patient care. The program featured 25 breakout sessions, many of which were accredited by JCAHPO. Participants had the opportunity to create their own track of programming, and receive up to 7.0 CE credit hours based on course attendance. A balance of front- and back-office sessions were offered to educate office personnel. The popular, Ophthalmic JEOPARDY! was brought back as a plenary session for all attendees. This session educated all audience members by providing ophthalmic ‘pearls for their practice’ in a fun and interactive learning environment. Below: Joseph Martel, MD presents to allied personnel members. 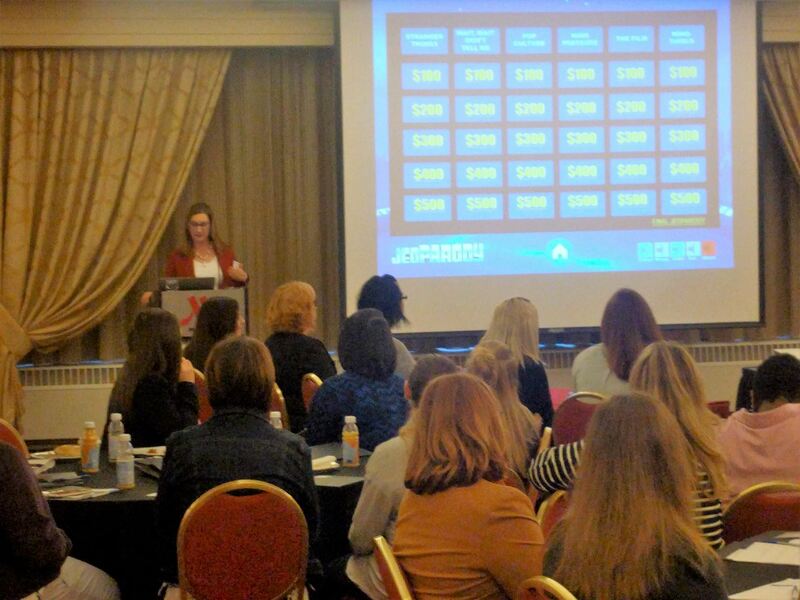 Pamela Rath, MD (course director) serves as game show host during Ophthalmic JEOPARDY! Below: contestants prepare to answer JEOPARDY question. Act 112 applies to any entity that performs a diagnostic imaging service in which a significant abnormality may exit. Act 112 is not limited to radiologists. The law also applies to other health care practitioners. It applies to “entities,” which likely include both health care facilities and health care practitioners. “Entity” is not a defined term under Act 112. However, as Act 112 applies to any entity performing a diagnostic imaging service in which a significant abnormality may exist, an entity would likely include individuals or facilities performing such a service. For non-members of PAMED, you may contact your liability insurance provider for interpretation and recommendations. 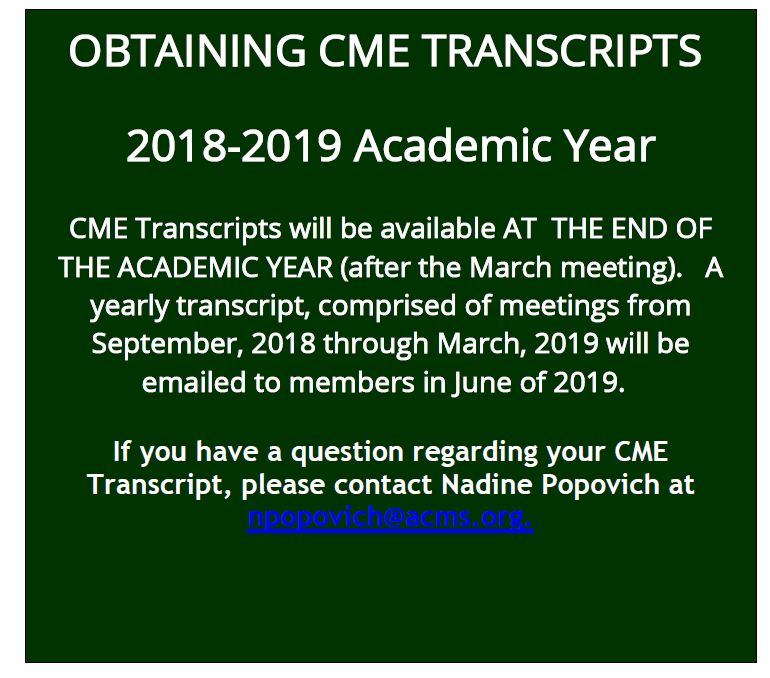 Members who attended the monthly meeting series will receive their CME Transcript in June. A copy will be emailed to the email on file. Dr. Foster was the final presenter of the POS 2018-2019 academic season and delivered two excellent lectures. Thank you to David Buerger, MD for inviting Dr. Foster to Pittsburgh. Following the first lecture, Sohani Amarasekera, MD, Resident at the University of Pittsburgh Eye Center, presented an interesting case for review and discussion. The Society would like to thank Allergan for support of the February meeting. Dr. Awh started the 2019 meeting season with two interesting presentations. 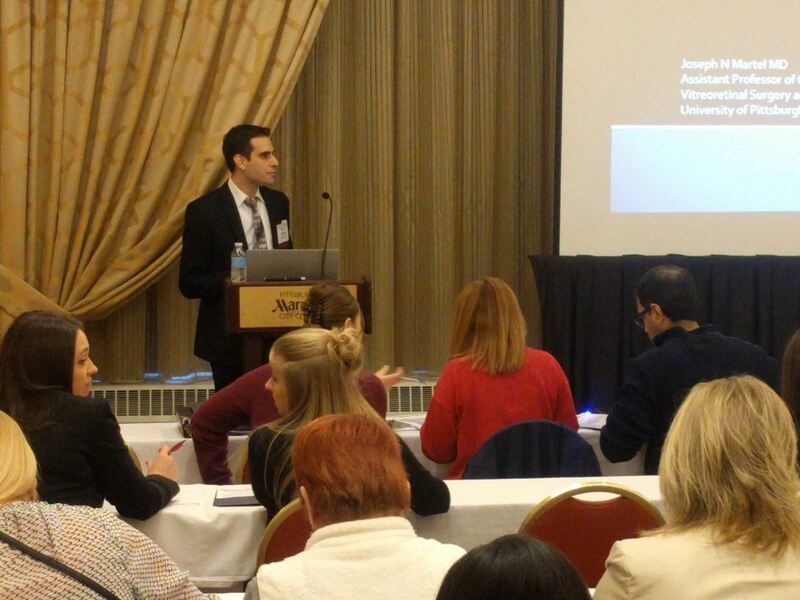 Following the first lecture, Benjamin Botsford, MD, Resident at the University of Pittsburgh Eye Center, presented an interesting case for review and discussion. Thank you to Dr. Verstraeten for inviting Dr. Awh to Pittsburgh and to Regeneron and Spark Therapeutics for support of the program. Debra Goldstein, MD (left) with Pamela Rath, MD (who invited Dr. Goldstein) and Sharon Taylor, MD, President. lFollowing Dr. Goldstein's first lecture, Jennifer Lee, MD, Resident at the University of Pittsburgh Eye Center, presented an interesting case for review and discussion. 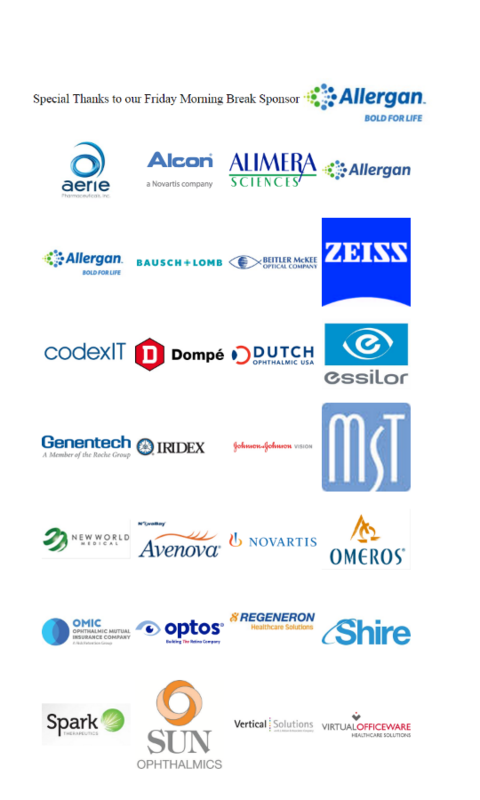 Thank you to Carl Zeiss Meditec and Genentech for co-sponsoring the meeting. Shakeel R. Shareef, MD (left) with Sharon L. Taylor, MD and Ian Conner, MD, PhD. (right). Dr. Shareef was the guest speaker for the October 4 meeting. 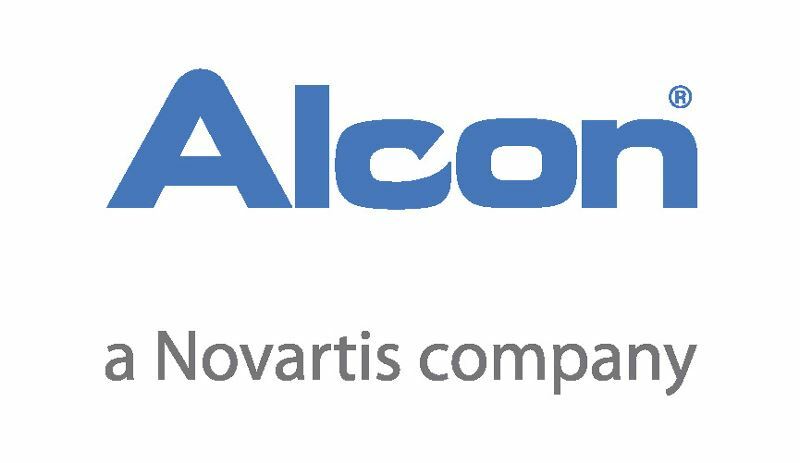 Thank you to Dr. Conner who extended the invitation to Dr. Shareef and to Alcon for sponsoring the meeting. 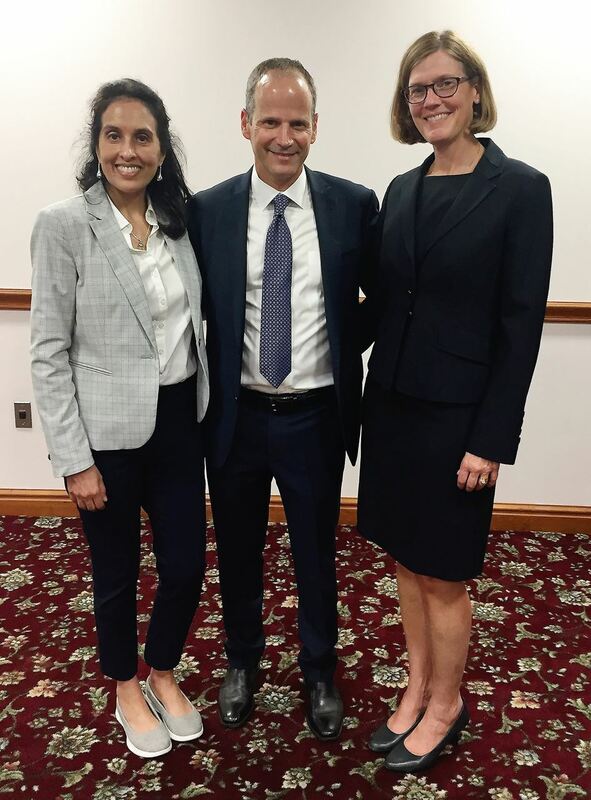 Steven G. Safran, MD (center) pictured with Deepinder Dhaliwal, MD (left) and Sharon L. Taylor, MD (right). Dr. Safran opened the 2018-2019 POS monthly meeting series with two outstanding and entertaining lectures to a robust crowd. Following the first lecture, Julia Kuhn, MD, Resident at the University of Pittsburgh Eye Center, presented "A Case of Watery Eyes: Approaching Ocular Surface Discomfort" for review and discussion. Thank you to Dr. Dhaliwal for inviting Dr. Safran. The September meeting served as a Vendor Appreciation. Exhibitors who sponsored the 2018 Annual meeting were invited to network with members during the social portion of the evening. The Pittsburgh Ophthalmology Society hosted the 2nd Annual Ophthalmology Community Wet Lab: MIGS and MORE. 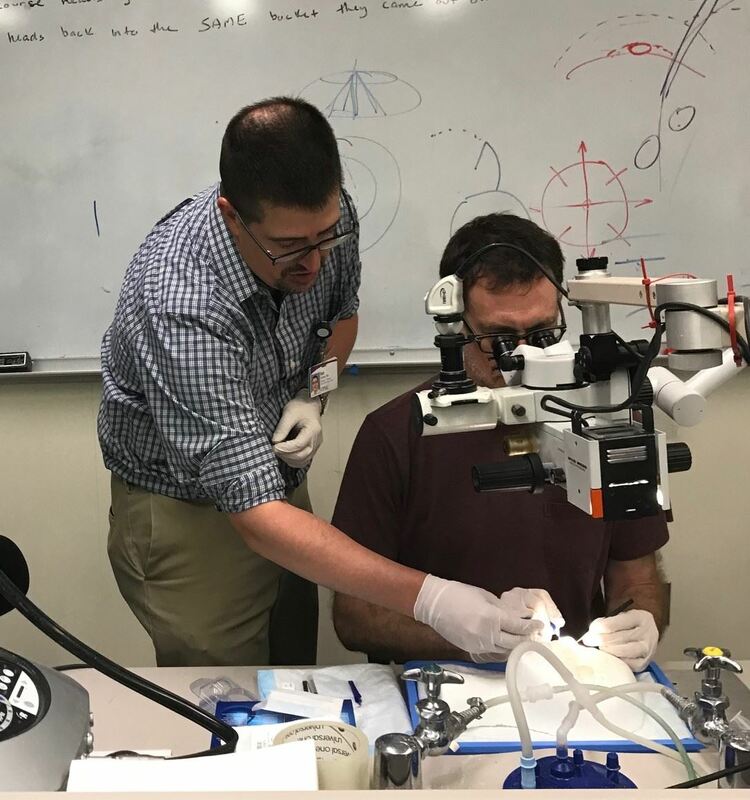 Two separate sessions, an introduction and advanced techniques, were held at the UPMC Eye Center – Eye and Ear Institute May 29 and June 13. Thank you to the following companies who were instrumental (pun intended) in providing equipment, support staff and teaching assistance for each 2-1/2 hour program: Alcon, Allergan, Bausch and Lomb, Glaukos, IanTech and New World Medical. We also thank UPMC Eye and Ear for use of the wet lab for this worthwhile endeavor. A maximum of 9 physicians attended each session where they had opportunity to participate in dry and wet labs for iLoop, iStent, Kahook blade, CyPass, and pars plana anterior vitrectomy with and without trocars. One-on-one learning and coaching was available, and each person was able to self-direct learning and practice opportunities. 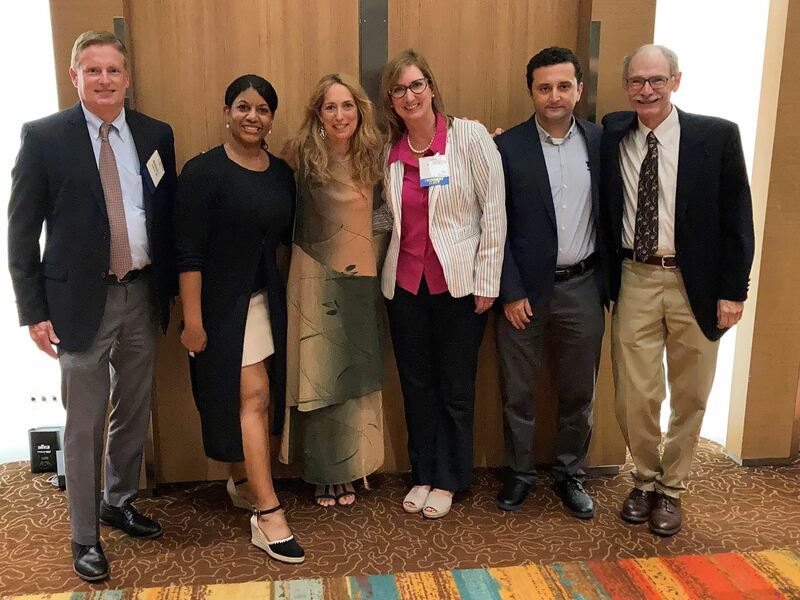 Sharon Taylor, MD and Ian Conner, MD, PhD served as course directors and initiated the program offering. The directors, industry instructors, and participants all shared their expertise and pearls of wisdom with their colleagues. Comments from participants were uniformly positive and the Society looks forward to offering sessions in 2019. 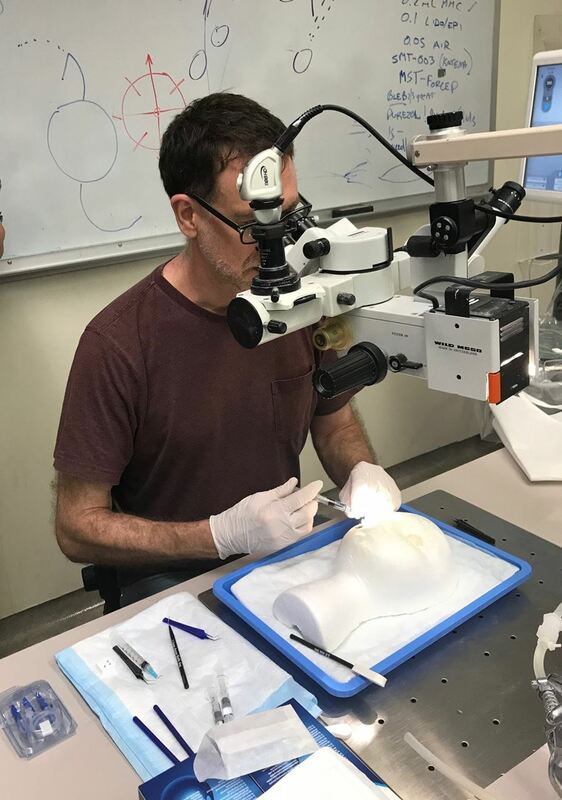 While we always plan to have vitrectomy practice available, we also welcome suggestions for future wet lab topics or for other educational sessions members would like to see offered. If you have a skill set others would benefit from learning and practicing, please let us know. Submit suggestions to Nadine Popovich, administrator, at npopovich@acms.org.